Faced with a poor outlook for natural gas prices, three producers have slashed their 2018 budgets by a combined $660 million, while a fourth warns that prices sustained at current levels would “paralyze” development in western Canada. Tourmaline Oil Corp., Arc Resources Ltd. and Peyto Exploration and Development Corp. have all scaled back their capital spending plans this week by as much as 30 per cent in light of volatile prices. Bonavista Energy Corp., which hasn’t released its 2018 budget but plans to “moderate” spending, said in its most recent earnings release that natural gas prices at the AECO pricing hub in southern Alberta averaged just $1.38 per gigajoule during the third quarter. “These industry-numbing prices, frequently fetching no bid on the day, were amongst the most volatile movements in pricing we have witnessed in our 20 years in the business,” the company said in the statement earlier this month. Natural gas sold in Alberta at the AECO spot price — opposed to NYMEX or Henry Hub gas prices — has been swinging wildly this fall, having plunged into negative territory for five straight days last month. Bonavista and other companies blamed TransCanada Corp. for the AECO price swings, after the pipeline giant made some service changes and restricted access to its gas network while doing maintenance on the system. For some producers, the restrictions also affected their access to natural gas storage, which “created an excess gas supply with nowhere to go, and it drove the prices down to ridiculously low levels,” said Mike Rose, Tourmaline’s chairman and chief executive. “We think that’s a negative for producers and for the Canadian gas business,” Rose said. According to Bonavista, the changes to TransCanada’s pipeline network “exaggerated” natural gas price declines in Alberta during the third quarter. “Clearly, continued pricing at these levels would paralyze much of the natural gas development activity taking place in Western Canada today,” the company said. TransCanada said it is carrying out much-needed work to expand and maintain its pipeline network, but gave producers advanced warning to minimize the impact of disruptions. In a statement, the company provided an alternative theory for natural gas price swings. It said a rise in gas production in Alberta has created a glut at the AECO hub, reducing prices. Natural gas producers could alleviate the strain by paying for additional services on TransCanada’s network, but have chosen not to, the company said. Aside from outages on TransCanada’s system, analysts say several other factors are battering the gas market, including growing U.S. supplies and weather issues. Prices have been sagging due to warmer winters in recent years, which meant “North America has been awash in gas,” said Jeremy McCrea, an analyst at Raymond James. Due to forecasts of low prices, Tourmaline has imposed the largest budget cut among gas producers in recent days, slashing its spending plans by $440 million, or nearly 30 per cent. The country’s second-largest natural gas producer, next to Canadian Natural Resources Ltd., said gas production next year will remain flat at late 2017 levels of 1.35 billion cubic feet per day, unless the price outlook improves. “We think the best deal for our shareholders is to keep gas production flat for now and make them a lot more money when gas prices go up,” said Rose, whose company has introduced a quarterly dividend of eight cents per share. ARC Resources was the latest to trim its budget Thursday, scaling back its spending outlook for next year by $140 million, or 17 per cent, over its 2017 forecast, to $690 million. Chief executive Myron Stadnyk said the leaner budget is due to efficiencies at the Calgary-based producer — “we can do more with less now” — but also a response to weak prices. It helps to have sold Saskatchewan assets to Spartan Energy last year for $700 million, Stadnyk said. Based on forecasts natural gas prices will improve in the latter half of 2018, Peyto plans to begin next year with a modest capital budget of $150 million. If prices rise as predicted later in the year, it will spend an additional $300 million. The combined $450-million budget represents a 15 per cent reduction from the 2017 envelope. 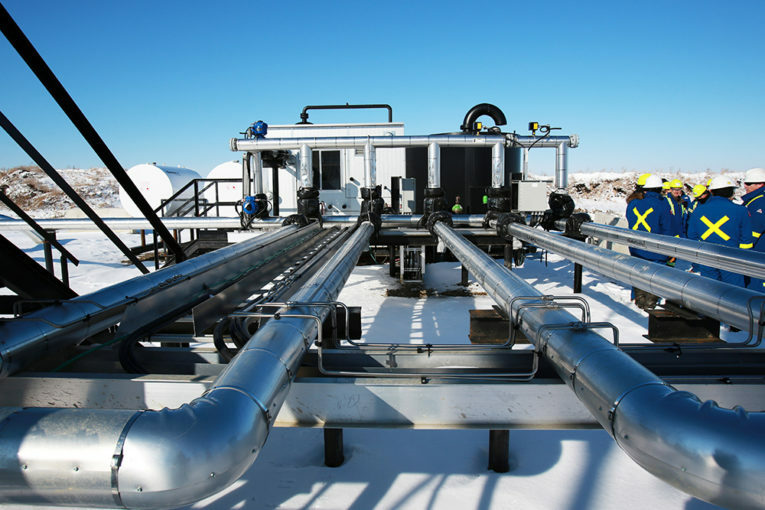 “What we’ve seen from many producers announcing their 2018 budgets is there is definitely recognition of the volatility in the AECO gas price,” said Darren Gee, Peyto’s chief executive.